Having analogue and digital working in perfect sync has always been a theoretical and practical challenge, as they typically rely on different physical interfaces. But Nicolas Bernier ’s “frequencies (a)” is a stellar exception. It’s made of tuning forks mechanically triggered with pure digital sound waves. 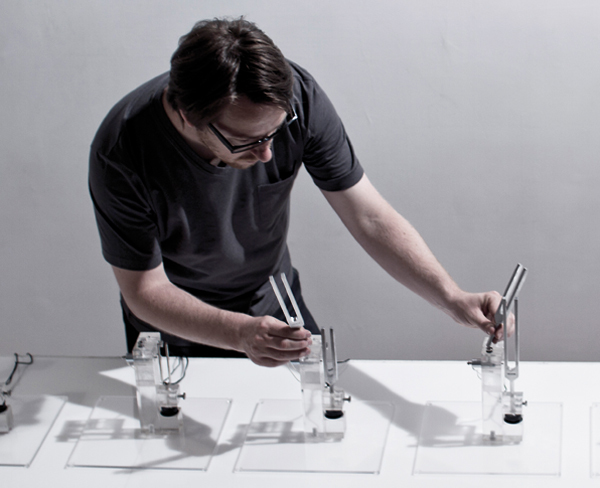 The performer triggers sequences from his computer activating solenoids that hit the forks very precisely, which are in sync with bursts of light coming from transparent acrylic structures. The system’s synchronization is painstakingly accurate and the use of light to enhance the sound emission serves the author’s concept: “making the sound visible and a stream of light audible”. The harmonic spectacle is purely cinematic and the functioning model simply ingenious. But in a second version called “frequencies (synthetic variations)” the analogue element has been removed, the speed is faster and the digital-induced bursts are then predominant. If the two versions are meant as a symbolic sequence, they’re highly persuasive.